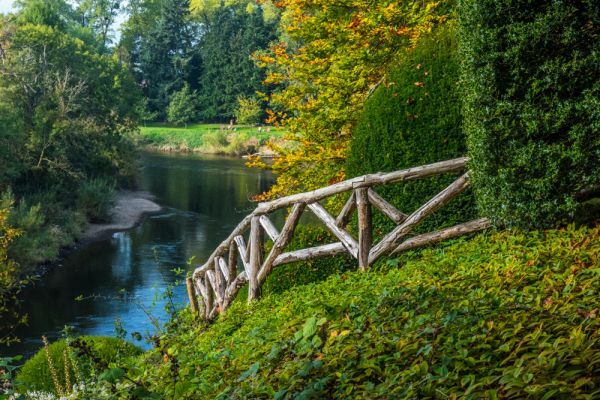 A lovely riverside garden in the Herefordshire countryside. 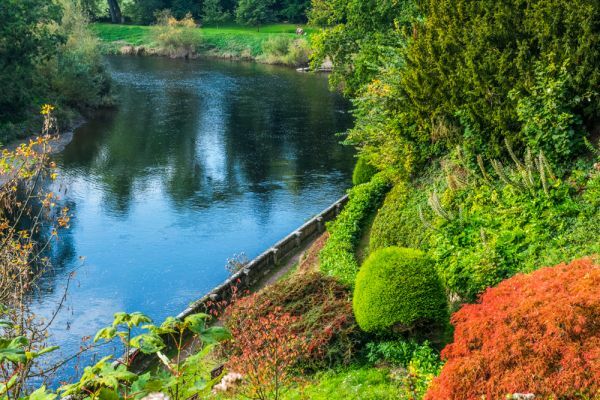 The Weir was established in the 1920s by Roger Parr and his head gardener, Boulter, and covers 10 acres of sloping land along the River Wye, with excellent views to the Black Mountains of Wales. The Weir is at its best from early Spring to Autumn, when the colours at their peak. The Parr family home high above the river is now used as a nursing home, but the gardens are in the care of the National Trust. Spring bulbs are a special feature, followed by wildflowers in summer, and finally Autumn colour from deciduous trees. Guided tours are available by prior arrangement. 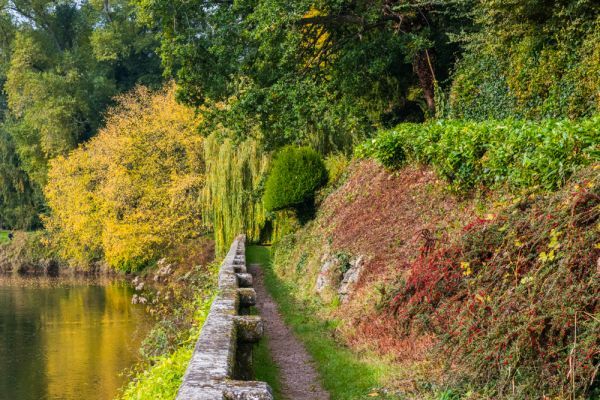 Special walks focussing on local archaeology and conservation are also available, and The Weir usually hosts an annual outdoor concert; details on the National Trust website. The paths were fairly good when I visited but I suspect they could get muddy after rain, so it really is a good idea to wear good waterproof shoes or boots. 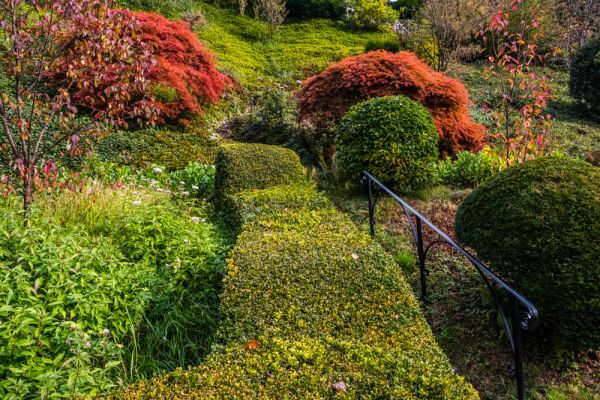 The south-facing slope of the garden makes it perfect for a wide variety of plants, and this helps attract insects and bird-life. Kingfishers can be seen by the riverside, as can mute swans and goosanders. Garden highlights include a Rustic Hut, designed by Roger Parr as a sheltered spot to watch the river during bad weather. The floor of the hut is made of white quartz, smooth river stones, and horse's teeth. 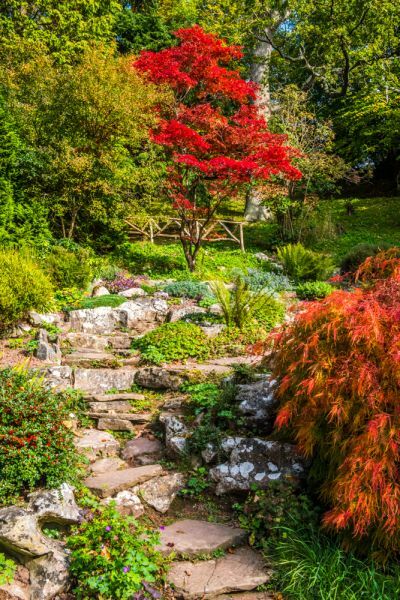 One of the earliest garden features is a viewing bridge, established in the early 20th century, with lovely views towards the Black Mountains of Wales. At the furthest end of the garden is a wide meadow area with deck chairs and picnic tables for relaxing, while on the river bank is a River Wall built in 1929, with a riverside path accessible at low tide. There is also a fascinating hydraulic ram, which originally pumped water to the Parr's house, but now supplies water to the rockery pools. 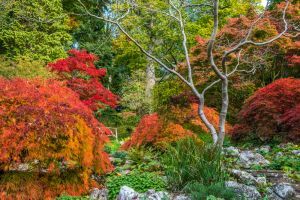 My favourite part of the garden was the Alpine rockery, with a glorious mix of Oriental trees and shrubs which turn a brilliant red in autumn. The colours were simply amazing. The site now occupied by The Weir has been in use for at least 2000 years. Excavations by ITV's Time Team in 2003 uncovered the fascinating remains of a large building established by the Romans, possibly by an official from nearby Kenchester town. The excavations revealed a pair of buttresses jutting out into the river which would have supported a terrace. Remains of a mosaic floor were also discovered. It isn't clear what the buildings were, but the most likely answer is a riverside villa for an important Roman official, or a temple with steps leading down to the riverbank. You can still see one of the stone buttresses very clearly, and the Trust has posted a couple of signs explaining the excavation work and an artist's interpretation of what the buildings looked like. Nearby is an octagonal cistern set into the earth, used to collect water from a spring. 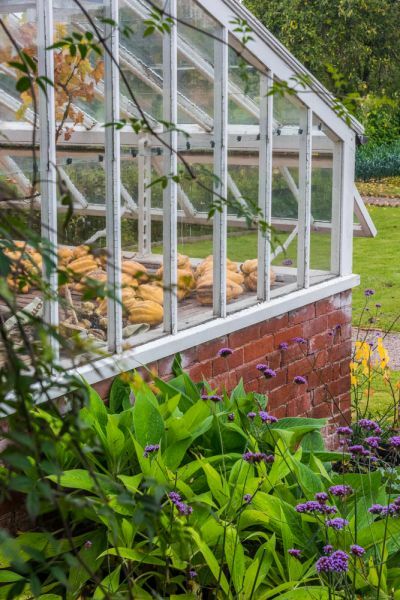 A short distance from the main garden, on the opposite side of the visitor car park, is a restored walled kitchen garden that supplies fresh fruit and vegetables to the nearby National Trust properties at Croft Castle and Brockhampton. Unusually for a walled garden, there are walls only on 3 sides, while the fourth side is open to give wonderful countryside views. The Weir definitely qualifies as a hidden gem. I would not be surprised if many people living in the Hereford area had never even heard of it. It certainly doesn't get a lot of publicity, but having visited it I can say it was one of the most enjoyable historic National Trust gardens I've ever seen. 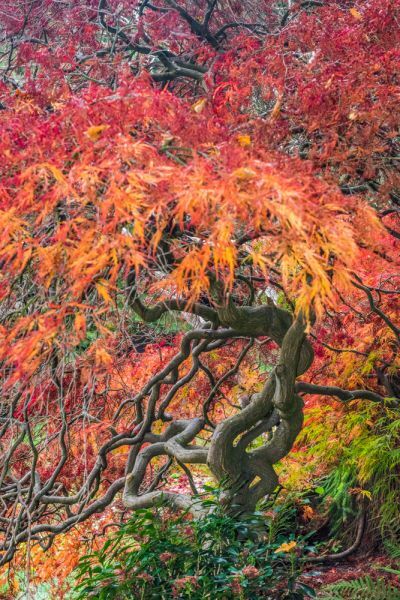 The location by the River Wye is simply superb, and the mix of colours, especially in autumn, is stunning, with bright reds, vivid yellows, and lush greens jostling for space, and glimpses of the river from almost every part of the garden. This is a place to linger and enjoy the day.